The Center for the Arts is hosting our first annual fundraiser on May 14th, "Dancing with the Lake Sunapee Stars!" at Colby-Sawyer College. This is sure to be a very fun evening with cocktails, hors d'oeuvres and a silent auction at 5:30, and the show beginning at 7:00. 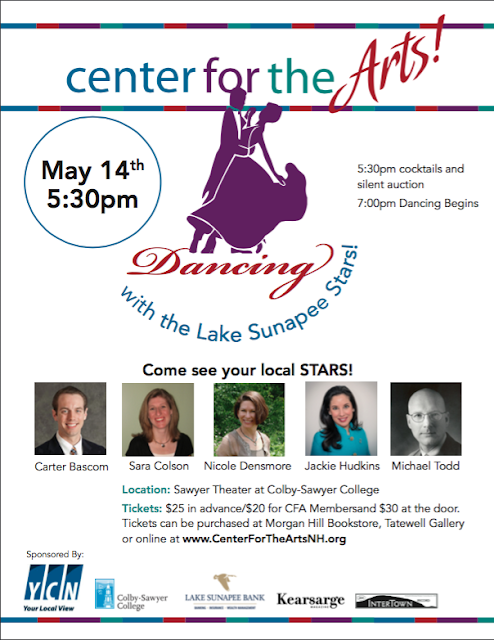 Proceeds from this event will help us fund our programs this year.... supporting the Arts and Artists in our region. We welcome your participation in our upcoming events, and we hope you will be able to support this effort! ...or at Morgan Hill Bookstore or Tatewell Gallery.